This topic contains 349 replies, has 17 voices, and was last updated by sonic.penguin 7 years, 6 months ago. Destiny of an Emperor 2.0: Cao Cao Edition Beta 1 Released! Whew! It took nearly two years of working, off and on, to research all the changes made in this mod and â€˜completeâ€™ it (to beta satisfaction), but the wait has been worth itâ€”it is finally here! Iâ€™ve completed the mod from start to finish with numerous new scripts, new storylines, and plenty of unexpected developments to provide an entirely new experience. Not only that, Iâ€™ve gone back through original levels to apply revisions and updates, brining the whole game up to a single standard. Now we begin the downhill ride to the final release for everyone to enjoy. I hope quite a few of you download and experience the Destiny of an Emperor 2.0 Cao Cao Edition mod! As your eyes will be the first ones looking over many game changes outside my own, there is a good chance you might catch things which I have missed. And there is still plenty of room left for suggestions. Please pay careful attention to game balance and scripts. Watch for incorrect officer names (such as Wu Tugu instead of LIu Bei). Watch for spelling errors. Was a script poor? Let me know so I can revise it! Was a battle too difficult or too easy? Did something leave you with a sour feeling? Did you find something to be particularly cool or fun? These are all things I would love to hear about! In testing the script, please talk to everyone. Please re-visit areas to read revised scripts. Thank you! And rememberâ€”it isnâ€™t too late to make game changes and fun adjustments. Iâ€™m still interested in your ideas and feedback. Even large game changes might be considered if viable and worthwhile. After having spent so much time on this project I don’t mind spending a little more to make it even better. Important notes which are relevant to previous discussion. I took a different approach with Dian Wei’s soldiers. What do you think? Xiahou Dun and Xiahou Yuan cannot be placed into billeting due to an unhandled exception. The MTP values have been adjusted to counter-balance the loss of two tactics and make it easier to play the game without focusing on resets. You can still do it if you like, but you can get good final values even without restarting. MTP gains now range from 4â€“6 instead of 3â€“5. Always use the latest armor when possible. Elixirs can help in a few stretches of the game. Guard is an extremely dangerous enemy tactic. Note enemy generals with Negate when using tactics like Guard, Thwart and Evade. High intelligence officers can be extremely helpful early in the game while dealing with enemies like Taishi Ci, Lu Bu, Dong Zhuo, Zhang Fei, Ji Ling and others. Later in the game low-intelligence officers can become a considerable liability as enemy tactics are much more dangerous, but don’t forsake strength in your party. By the time you reach Yuan Shuâ€™s territory Resurrects should be well stocked. Do not forget the Trident in Nanyang. Give it to a 1,000+ soldier warrior. Do not forget to buy Wood Hs in Wan as soon as Ma Chao joins. Use surplus money to purchase Power Pills. Plan their use (Zeal + Wang Shuang or Wen Chou + 1,000 soldiers + Power Pill = roughly 1,000 soldiers damage in a single blow). Smoke Pots will help to survive long trips and caves. Expect some surprises in battles. Some old DoaE rules have been broken. Re-evaluate each tactic as you learn it. Many have been adjusted, sometimes considerably. Get to know your tacticians. They offer greater variety than they ever have before. Get to know new officers. Some might offer unique surprises. If you are stuck, consider new strategies with your tactics, or gain a few levels. A key tactic might soon become available (such as Guard when entering Jingzhou). I almost alway sget the gold key and every time I do there they are, but when I don’t, they aren’t there. However one time I got the gold key and got Zhou chao, but I didn’t recruit Lu BU and there was no wang gui, or maybe vice versa with gui and chao. You could have Zhuge Liang kill Liu Shan for his utter incompetence. I tried to go with a more-or-less timeline true one when I was planning. The Xiahous didn’t join up until the Dong Zhou coalition, so you could replace Guan Ping with one… not sure where the other would come from though. 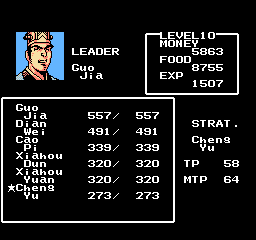 Cao Cao got too many good officers early on. You might have to make this one really tough early to make up for that. Yeah co pretty had a dream team to start with, added difficulty would be okay for this case I believe. Wth Wei, there could be maybe to may officers. who would be the final six officers to fight zhuge? that is, if you plan on using different people for the original guan yu and zhang fei. who do you plan on using for those spots? and who takes over for them when they leave? Dun and Yuan will likely replace Zhang and Guan. They will be exchanged for other good officers… maybe Cao Zhang and someone else. Cao Pi will probably be your champion/leader through the game. Sima Yi will be your best strategist. You will have a very versatile party. You will need it, though, because this will likely be harder than DoaE 2.0.